he 2016 edition of the Danish Maritime Days is, with more than 40 events, slightly smaller than in the beginning, but the events that have survived are stronger and more visible now. This applies not least to the Danish Maritime Fair, based in Lokomotivværkstedet, that house a good part of the activities of the Danish Maritime Days. 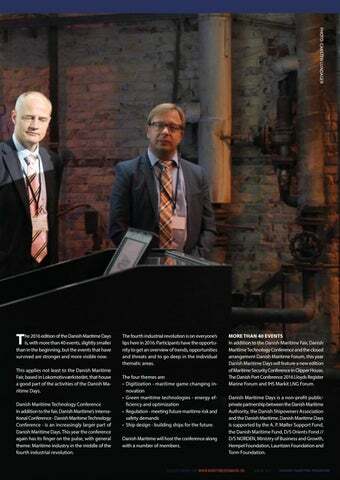 Danish Maritime Technology Conference In addition to the fair, Danish Maritime’s International Conference - Danish Maritime Technology Conference - is an increasingly larger part of Danish Maritime Days. This year the conference again has its finger on the pulse, with general theme: Maritime industry in the middle of the fourth industrial revolution. The fourth industrial revolution is on everyone’s lips here in 2016. Participants have the opportunity to get an overview of trends, opportunities and threats and to go deep in the individual thematic areas. The four themes are: • Digitization - maritime game changing innovation • Green maritime technologies - energy efficiency and optimization • Regulation - meeting future maritime risk and safety demands • S hip design - building ships for the future. 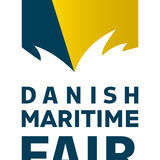 Danish Maritime will host the conference along with a number of members. MORE THAN 40 EVENTS In addition to the Danish Maritime Fair, Danish Maritime Technology Conference and the closed arrangement Danish Maritime Forum, this year Danish Maritime Days will feature a new edition of Maritime Security Conference in Clipper House, The Danish Port Conference 2016 Lloyds Register Marine Forum and IHS Markit LNG Forum. Danish Maritime Days is a non-profit publicprivate partnership between the Danish Maritime Authority, the Danish Shipowners Association and the Danish Maritime. Danish Maritime Days is supported by the A. P. Møller Support Fund, the Danish Maritime Fund, D/S Orients Fond // D/S NORDEN, Ministry of Business and Growth, Hempel Foundation, Lauritzen Foundation and Torm Foundation.